Exhaustion hangs in the air, more frigid than the desert night outside. Eighty-four women are huddled inside a large event tent erected in mere hours to provide a base camp for a single night, anxiously anticipating to hear the day’s results. Former professional off-road racer and current race director Emily Miller takes the stage to address the room of competitors as they bustle around, shoving down dinner and discussing the points from today’s course. “Congratulations, ladies. You’ve completed day four, which means you’re halfway there.” With roughly 800 miles driven so far, the women have another 800 ahead of them. This is no ordinary road trip. This is the Rebelle Rally. Founded in 2016 by Emily Miller, the Rebelle Rally is the longest competitive off-road rally in the lower 48 states. Miller likes to say it’s a world-class event that just so happens to be for women only. Showing up to the event at the halfway point as a first-time off-roader, I had a few things to learn. Most importantly, the difference between a rally and a race. However, since the event is world-class, there is, of course, a scoring system in place. Teams are awarded points by finding various checkpoints hidden throughout the course. Some days have the same start and end location but more checkpoints, while others are a point-to-point route with a few scatterings along the way. Beginning in Lake Tahoe, the course travels down to San Diego and covers a total of 1,600 miles, 12 counties, and two states. By the way, did I mention that no electronics are allowed during the competition? Yeah, there’s that. The competitors must navigate every day using only a map and compass. The Rebelle is an endurance challenge, and some days the women are at it for up to 10 hours or longer. Mornings began with a 5 a.m. wake-up call followed by teams being given the geographical maps for the day and a list of checkpoint coordinates. Once the maps are handed out and start times are assigned, things really kick into gear. Teammates hustle to plot as many of the checkpoint coordinates on their maps before they have to be at the start line. Green checkpoints are marked with large flags and are the easiest to find, blue will either have a flag or only a blue painted stick in the ground, and black checkpoints have no marker at all. For the blacks, teams must be within 50 meters of the provided coordinates to receive the points. My partner for two days was Olympian and big-mountain skier Wendy Fischer. Fischer competed in the Gazelle Rally in Africa with Miller back in 2006 and is no stranger to overcoming an intimidating challenge. As her temporary teammate, I was exposed to only two days of the rollercoaster ride the women experience for eight. Celebrations of highs from finding checkpoints are starkly contrasted by the lows of being lost and frustrated by having no idea how you messed up. However, that’s the point of the rally. The women do not need to be professional drivers or navigators to compete. The event is structured so that participants can make mistakes to learn from in a safe and supportive environment. During my two days on course, I witnessed teams helping each other out. Whether it was co-navigating to checkpoints or digging vehicles out of sand pits, the atmosphere was one of comradery. The philosophy behind the Rebelle is no mistake; Miller has a goal for the participants and that is to come out stronger by the end of it. Having coached over 4,000 people to drive off-road, Miller structures each day with lessons in mind. Trained by one of the most winning off-road racers with the longest string of unbroken race wins, Rod Hall, it’s easy to say that she knows what she’s doing. Miller and her team took the Rebelles on an unforgettable journey, working with five BLM field offices, two BLM state offices, two National Parks, and the U.S. Forest Service. 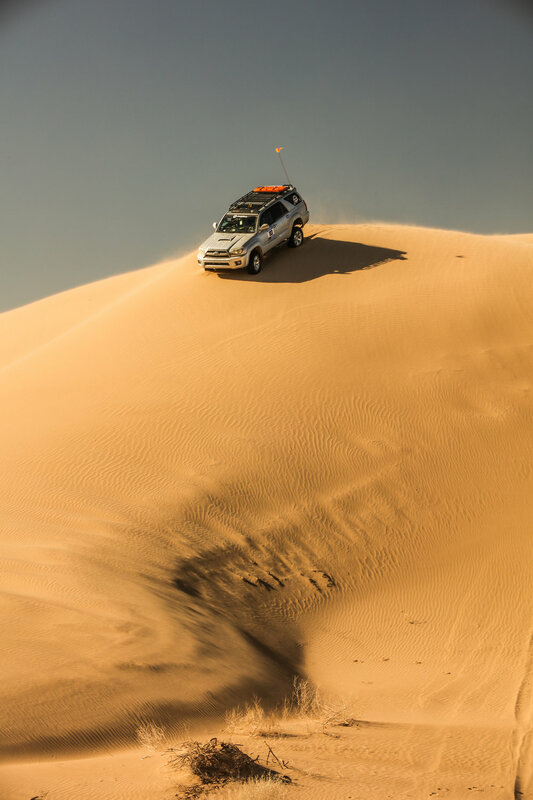 The participants were provided a course which took a year-long permitting process and traveled from extremes like the high alpine of the Sierra Nevadas to the desert sand dunes of Glamis. The Rebelle Rally helped these women answer that question not only in the literal sense of navigation but also in their lives. Pushing the participants mentally, physically, emotionally, and spiritually was not a mistake, but rather the unprompted goal of the rally. As Miller once said, “You can only know your limit once you find your edge and dare to push past it.” The participants who completed the 2018 Rebelle Rally gained the navigational revelation that in life, their limits no longer exist.